It’s not Christmas without visiting the best Chicago family on screen: The Griswald’s. Since we’re getting closer and closer to Christmas, if you haven’t poured yourself a moose mug of eggnog and watched Christmas Vacation yet, it’s about damn time you did. To help get you in the mood, here are 13 Fun Facts about National Lampoon’s Christmas Vacation! Clark Griswald’s childhood home was the same house used to film the TV series, Bewitched…and it’s actually not a house at all. It’s part of the Warner Bros. back lot, located on what is known as Blondie Street. The rest of the neighborhood is located there, as well, including the home of Todd and Margo, which is where Roger Murtaugh (Danny Glover) and his family lived in Lethal Weapon. The only other Christmas movie to come out in 1989 besides Christmas Vacation was Prancer. Johnny Galecki (Rusty Griswald) starred in both. Christmas Vacation had an unusually high budget for a comedy: $27 million (probably to pay for all those lights!). However the movie had no problem making its money back. Its final domestic gross was more than $71 million. Christmas Vacation, which was a sequel to National Lampoon’s Vacation, spurred its OWN sequel, National Lampoon’s Christmas Vacation 2: Cousin Eddie’s Island Adventure. It was made for TV and finds cousin Eddie and his family stranded on an island in the South Pacific. Not surprisingly, it has a 12% approval rating on Rotten Tomatoes. Eddie’s sweater/Dickie combo was actually a suggestion from Randy Quaid’s wife. You can buy your own Dickie, as well as your own set of Moose mugs and much more, right here: http://www.christmasvacationcollectibles.com/. Christmas Vacation was the final film for Mae Questel (Aunt Bethany), who started her career voicing Betty Boop in 1931. There were no rehearsals for the actors on Christmas Vacation. Chevy Chase’s tendency to ad-lib and improvise made such preparation useless. 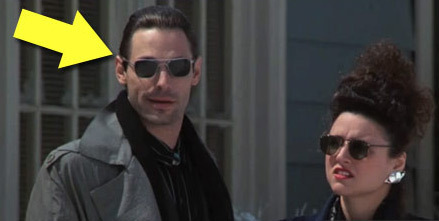 The Griswald’s neighbor, Todd, is played by Nicholas Guest, brother to actor/director Christopher Guest (Waiting for Guffman, Best in Show, The Princess Bride, Spinal Tap). The famous insult scene where Chase rants on about his boss took a lot of planning. In order for the long-winded rant to go on without stopping, Chase had the crew place cue cards all over the set with various insults on them so he wouldn’t have to stop. The production crew originally had a trained squirrel for the scene where it wreaks havoc on the house. Unfortunately, it died the day before the scene was shot. An untrained squirrel was used instead…adding to the chaos, of course. Chase still has the PJ’s he wore in the film. His daughter has said that he wore them all the time. Chase broke his pinky filming the scene in the front yard where he’s kicking and hitting the decorations. Like a pro, he didn’t break character, but he used the pain to continue through the scene. When Clark Griswold is having a hard time getting the Christmas lights to work, he turns to his son, Rusty, who answers with a classic Chevy Chase gag – looking at an imaginary watch on his wrist and excusing himself.